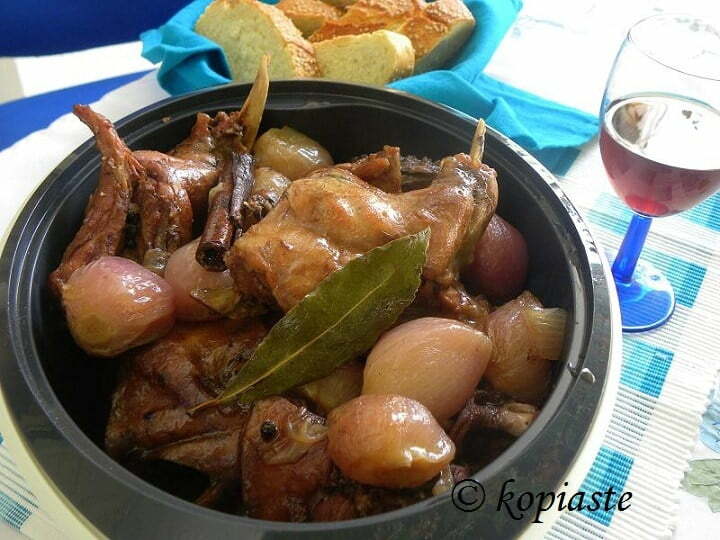 Stifado also written stiffado, is a Greek stew which is either made with hare but domestic rabbits are just as good for this dish. Beef or veal is also used and cooked the same way. What is essential for a good stiffado are lots of onions, preferably baby shallot onions but whole onions can also be used and this gives the meat a wonderful taste and sweetness. In Cyprus no tomato is used and the stew is cooked with red wine and vinegar and spiced with cinnamon, bay leaves and lots of peppercorns. You will find the recipe for the Rabbit Stiffado in my Cookbook “Mint, Cinnamon & Blossom Water, Flavours of Cyprus, Kopiaste!”. The recipe with veal which follows is almost the same with a few minor differences. In a sautéing pan heat the olive oil and sauté the meat on both sides. Remove to a platter and add the onions. Sauté until translucent and then add the meat back. Add the wine and cook for 2 – 3 minutes until alcohol evaporates. Add the two types of vinegar, tomato, petimezi or honey as well as all the spices. Bring to a boil and lower heat to a simmer; cover with the lid and cook, mixing regularly, until the meat is tender. (If necessary, check if the meat is not done, add some water and cook until it is tender soft). Serve with rice pilaf, fried potatoes or mashed potatoes. This recipe and all my Cypriot recipes will be soon published in a cookbook. My mom always used rabbits for stew,with carrots,potatoes,and onions,in a sauce made from milk,flour, butter,and seasonings.